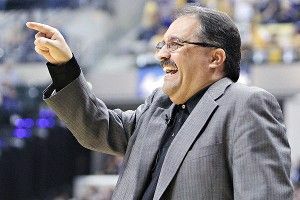 On Monday, Stan Van Gundy was fired from his job as coach of the Orlando Magic. After the emotional tractor trailer jack-knifing that was this Magic season, this move was inevitable. It was a day of housecleaning for the franchise, as they also relieved general manager Otis Smith of his general management duties. Somewhere, no doubt, Dwight Howard ran through a wall, Kool-Aid Man-style, in delight. While current Magic players might not miss SVG’s demanding ways, we, the fans, will miss his inimitable press conferences and media interactions. So by way of tribute, here are some of Stan’s greatest on-camera moments. Look forward to seeing you on the Bucks sideline some time after Chirstmas, buddy.